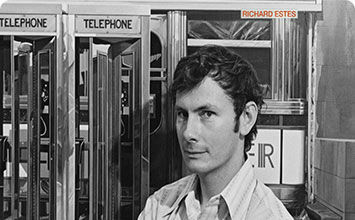 When Richard Estes arrived on the New York art scene, Abstract Expressionism had largely run its course. In contrast to the acutely personal, emotional, unstructured, and (some would contend) self-indulgent aesthetic of The New York School, Estes among others introduced a form of painting that emphasized control and an almost machine-like precision. In part, his style emphasized the craft of painting, which was central to the hard-edged, jaw-dropping verisimilitude of photorealistic art. Artists like Estes, Audrey Flack, Chuck Close, and Ralph Goings abandoned the drama of gestural painting and promoted a kind of hyper-realism that seemed more visually descriptive of the increasingly high-tech, post-war age. For Estes, the appeal of the gleaming, reflective surfaces of New York City were irresistible. His paintings, composites of multiple photographs, suggest that the modern world is a sharply articulated one of clean, intersecting lines: orderly and systematic in presenting information about itself. Rather than humans, every kind of material and object tells its own story in an Estes painting to which the artist has always been reluctant to assign symbolic meaning. While Estes' paintings appear to be direct, painted copies of photographs, he actually combined multiple photos, often quite loosely, figuring out his compositions in underpaintings he produced using acrylic paint. He would sometimes move elements as he began working to strengthen his compositions and more closely control visual effect. As a consequence of Estes taking these artistic liberties, when viewers have tried to match his paintings with actual sites in New York City or elsewhere, they often discover surprising inconsistencies. A major compositional strategy for Estes was often to bisect his paintings, producing a kind of split-screen result. This has the effect of making it seem as though you're looking at two different paintings or even worlds. This tactic probably relates to the often surprising juxtapositions of visual elements in the crowded city or, for instance, in a wilderness setting in which technology intrudes, as with his painting of a boat cutting through the icy water in the Antarctic. By creating his photorealistic montages that seem convincingly whole, Estes produces works in which there are multiple focal points. He confounds the concept of the mathematical or one-point perspective, the Renaissance invention that provided drawn and painted images with the illusion of depth. Instead, viewing a typical Estes painting feels like one is constantly changing vantage points; it's a bit like the effect of covering one eye, then the other and observing how that alters one's view. Until the 19th century, the craft aspect of painting was regarded as enormously important. Demonstrating one's skill as a draftsperson and a technically-gifted painter was as important as the subject of an individual work. With the advent of modernism, the technical virtuosity of an artist was challenged, brushstrokes emphasized, and traditional materials and methods were rejected if not dispensed with completely. Estes, among other artists, rejected the bias against craft by creating hyper-realistic paintings that recall the trompe l'oeil paintings that had for centuries provided a means for artists to display their superior technical prowess. While in many of Estes' earlier urban paintings, cities are often deserted, here the Telephone Booths are occupied. If not for the figures in the phone booths, whose bodies create a kind of middle ground in the painting, the work would potentially devolve into further abstraction controlled largely by the strong geometric components like the frames and doors of the booths. Still, the reflections of fragments of the city - from passing taxis and strolling pedestrians to shop signs - seem to compete for space in the ambiguous depth of the composition. The result is a very confusing image that seems to be flat and yet shifts back and forth between shallowness and depth constantly. Double Self-Portrait is an unconventional self-portrait. At first glance, Estes seems not to be the primary focus of the piece. We first observe him slightly to the right and below the center of the canvas. He is standing outside on the sidewalk in front of a diner with a camera mounted on a tripod. His hands are on his hips, and he is dressed casually in jeans and a short-sleeved shirt. His reflection appears alongside the slender white frame at the center of the large windows at the front. His reflection is bisected at the waist by a looping yellow linoleum counter that wraps around the front windows and the food preparation area at the center of the space. Estes's 'double' is easy to miss as it is very small and there is so much other 'noise' on the canvas. But the second Estes is actually directly in the center of the canvas, in a mirror at the rear of the restaurant. He is only visible from the waist up. The scene appears to be set before the diner has opened, in the early morning. This pristine, untouched storefront brings to mind Edward Hopper's Early Sunday Morning (1930) and Estes' reflections do little to mitigate the sense of urban bleakness that seems to update the earlier classic painting. Estes' signature splitting of a single image is apparent in this painting in which the interior of the ubiquitous Murano glass shop provides a shallow, largely flat contrast to the layers of reflection in the large glass storefront. His many "storefront paintings" are most certainly inspired by the photographer Eugene Atget's window displays (and reflections) from the 1920s. 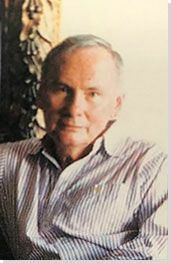 Though Estes moved to an apartment and studio space near Central Park West in 1971, he began incorporating New York's iconic green space into his painting only in 1987. He took the title from the composer Stephen Sondheim's Sunday in the Park with George (1984), a musical inspired by Georges Seurat's Pointillist masterwork, A Sunday Afternoon on the Island of La Grande Jatte (1884 - 86). Estes knew the painting well, having developed an affinity for it during his years at the Art Institute of Chicago. The Plaza, as with many of Estes' works, reads, like a conventional two-part painting or diptych. It represents two radically different environments: the enclosed, protected space of a city bus and the open, busy vehicle and pedestrian space near the famous Plaza Hotel at the southern end of Central Park. The view on the right side of the picture offers a slightly distorted view of this particular area of New York City. The street appears wider than it is in reality and juts off at a diagonal near the hotel. Meanwhile, the structure of the bus is strange: it seems to widen very radically toward the foreground, as though there is a bend in the midsection of the vehicle. It literally opens up to admit the viewer into the interior. In this portrait, I.M. Pei is seen in the far left middle ground, resting his arm on a railing, creating a line that draws one's eye directly to his figure. Behind him, Estes shifts the visual plane entirely, modeling the architecture of Pei's building interior, and showcases rows of exposed floors that all get cut off by a structural grey brick wall that spans the building. Then, the vantage point shifts again, showing a brightly lit six-story library. As the viewer's eye is guided across the composition with linear cues, modeling the masterful architecture of the building, the far right section of the painting boasts the grid-like set of windows with a view that places the Capitol Building plainly in sight. Water Taxi, Mount Desert takes inspiration from the people and landscapes of Mount Desert Island, Maine, where Estes has owned a home since the early 1970s. It depicts fellow painter, Nancy McCormick, and her daughter, Nina, riding in the back of a water taxi as it carries them to Northeast Harbor. They seemingly have the entire craft - and the spectacular view - to themselves. Estes expertly renders the wicker furniture and plastic windbreak and also manages to capture people moving from one world to another - from so-called civilization to the quiet of the island. Nancy and Nina watch the sea and land sweep by with keen attention, and the viewer is drawn into the flux of transition and movement. Estes's first trip to the Antarctic in 2007 inspired a series of twelve paintings of the world's most sparsely inhabited continent. It is difficult to imagine a setting further away from New York City. Like many visitors to Antarctica, he saw the continent from a cruise ship. Although inclement weather prevented him from leaving the boat during this first trip, he returned in 2011 and was able to make excursions on-shore.